Unit of measure classes represent groups of units of measure with similar characteristics. Creating unit of measure classes is the first step in unit of measure management. Each unit of measure you define must belong to a unit of measure class. Each class has a base unit of measure. The base unit of measure is used to perform conversions between units of measure in the class. For this reason, the base unit of measure should be representative of the other units of measure in the class, and generally one of the smaller units. For example, you could use CU (cubic feet) as the base unit of a class called Volume. Unit of measure classes are not organization-specific. Default unit of measure classes are not provided. 1. Enter a unique name for the unit of measure class. 2. Define the base unit of measure for this class. 3. Define a unique abbreviation for the base unit of measure. Units of measure are used by a variety of functions and transactions to express the quantity of items. Defining units of measure is the second step in unit of measure management. 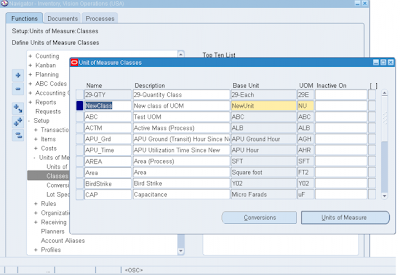 The values defined in the Units of Measure window provide the list of values available in unit of measure fields in other windows. Units of measure are not organization-specific. Theprimary unit of measure is the stocking unit of measure for an item in a particular organization. 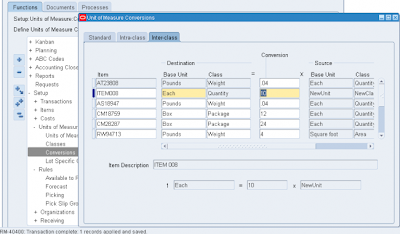 The primary unit of measure is an item attribute that you specify when defining each item. You must define at least one unit of measure class. After defining the UOM class click on Uint of measure button to enter a new UOM. Navigate to the Units of Measure window. 1. Enter a unique name for the unit of measure. 2. Enter a unique abbreviation for the unit of measure with a maximum length of three characters. For example, EA for each or HRS for hours. 3. Enter a unit of measure class. 4. Indicate if this is the base unit of measure for the unit of measure class. 1. You can delete existing units of measure that are not base units of measure if no standard or item specific conversions are defined. 1. Enter the date on which the unit of measure becomes inactive. As of this date, you can no longer assign standard or item-specific conversions to the unit of measure. Unit of measure conversions are not organization-specific. Itemspecific: Only uses unit of measure conversions unique to this item. If none exist, you can only transact this item in its primary unit of measure. Standard: Uses standard unit of measure conversions for this item if an item-specific conversion is not available. Both: Uses both item-specific and standard unit of measure conversions. 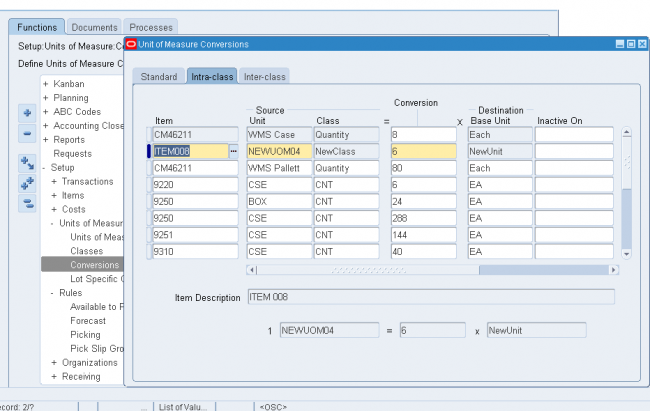 If both exist for the same unit of measure and item combination, the item-specific conversion is used. Whenever you enter an item's quantity, the default is the primary unit of measure for the item. The list of values for the unit of measure field displays all units of measure for which you have defined standard and/or item-specific conversions from the primary unit of measure. Transactions are performed in the unit of measure you specify. 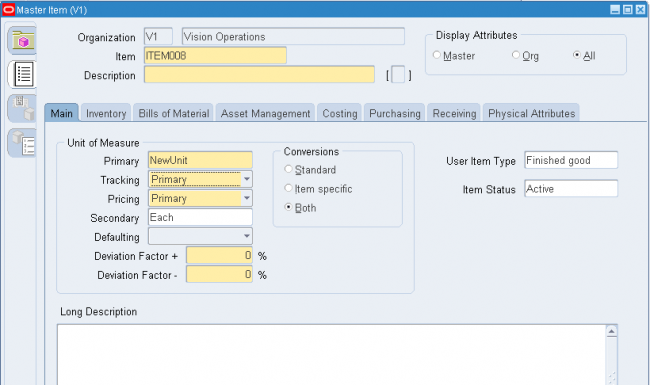 The conversion happens automatically and item quantities are updated in the primary unit of measure of the item. Important: Inventory transactions and on hand balance supports decimal precision to 5 digits after the decimal point. Oracle Work in Process supports decimal precision to 6 digits. Other Oracle Applications support different decimal precision. 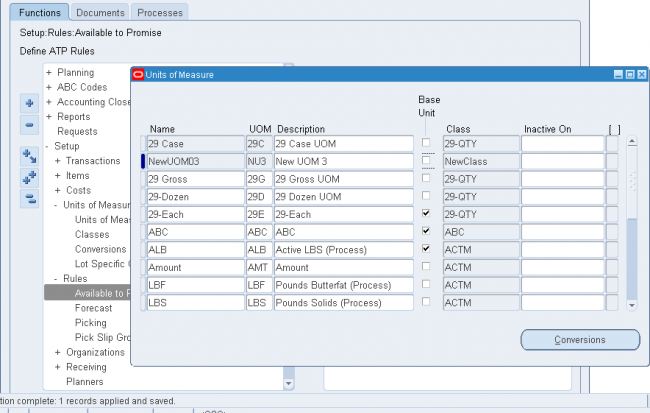 As a result of the decimal precision mismatch, transactions another Oracle Application passes may be rounded when processed by Inventory. If the transaction quantity is rounded to zero, Inventory does not process the transaction. It is therefore suggested that the base unit of measure for an item is set up such that transaction quantities in the base unit of measure not require greater than 5 digits of decimal precision. 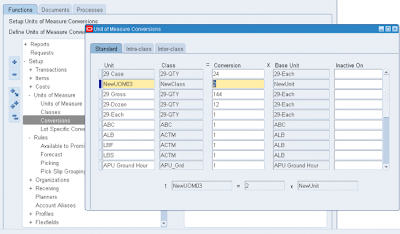 In standrad conversion you specify how one unit of mesaure is related to the primary unit of measure in the same class. 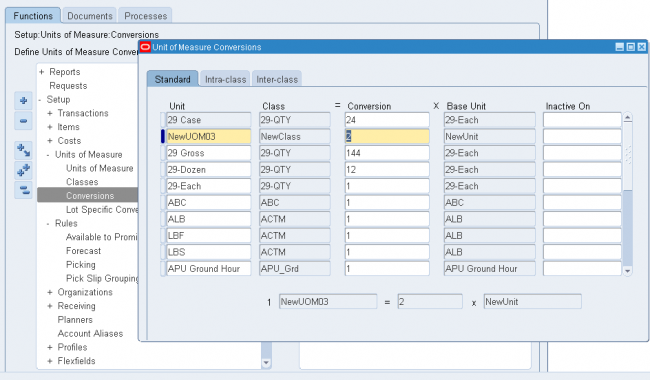 Navigate to the Unit of Measure Conversions window & Select the Standard tabbed region. 1 Enter a unit of measure. 2 Enter the conversion factor by which the unit of measure is equivalent to the base unit of measure established for this class. For example, if one DZ (this unit of measure) is equivalent to 12 EA (base unit), the conversion factor is 12. Or, if EA is equal to one-twelfth of a DZ, the conversion factor is 0.08333. We have seen in standard conversion we can only do convesrion from one UOM to primary UOM. Suppose we have defined a UOM convsrion rule for a unit of measure UOM_XYZ as UOM_XYZ = 6 x Primary UOM but for a particular item the vonvsrion rate is not 6 in that case we define a intra class convesrion for a particular item and when ever that item is transacted system 'll pick the convesrion rate from either intra class or standrad convesrion depending upon ITEM master set up. 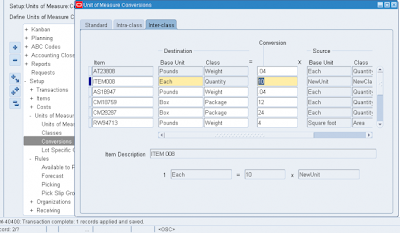 We can do intra class conversion between two UOMs for a particular item only for a single class which is the UOM class of the primary UOM of the item. For exampe Suppose ITEM001 has a primary UOM as Ea and UOM Ea belongs to class Quantity then we can define intra class conversion for the item ITEM001 between two UOMs in the class Quantity. we cant define intra class convesrion between any other UOMs belonging to a differnt UOM class. Navigate to the Unit of Measure Conversions window. 1. 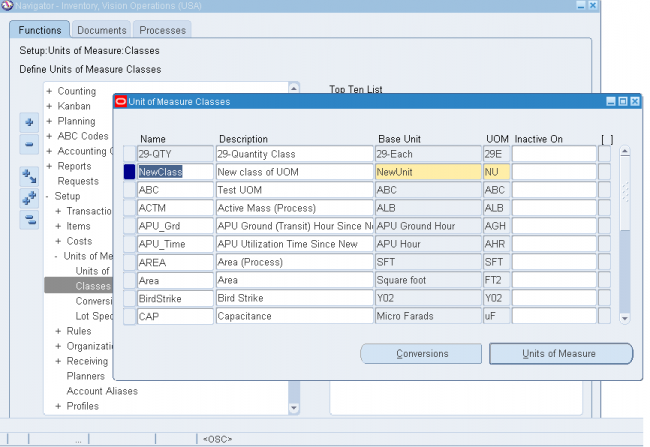 Select the Intra-class tabbed region. 3. Enter a unit of measure. 4. Enter the conversion factor by which the unit of measure is equivalent to the base unit of measure established for this class. For example, if one LB (this unit of measure) is equivalent to 16 OZ (base unit), the conversion factor is 16. 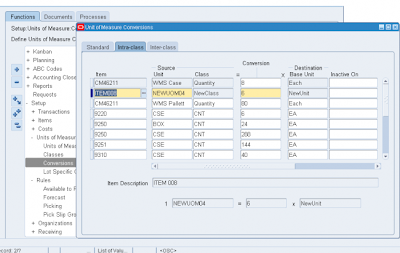 Inter class conversion is used to convert an item from one primary UOM in one class to another primary UOM in a differnt class for a particular item. 2. 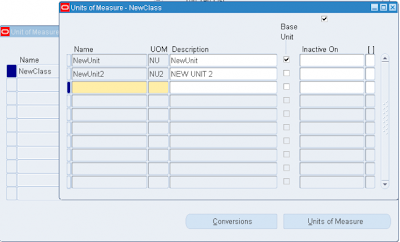 Select the destination base unit of measure of the class to which you are converting a unit of measure. 3. Enter the conversion factor by which the source base unit is equivalent to the destination base unit. For example, if one ML (source base unit) is equivalent to one GR (destination base unit), the conversion factor is one. Lot specific conversions enable you to perform a specific inter-class conversion for a given lot. This enables you to establish more granular control over the transactional quantities of a lot. For example, the standard inter-class conversion for a lot controlled item is one gallon equals 15 pounds; however, when you receive a particular lot of the item, 1 gallon equals 16 pounds. You can create a lot specific unit of measure for this instance. You can create lot-specific unit of measure conversions for on-hand lots or lots with a zero balance. 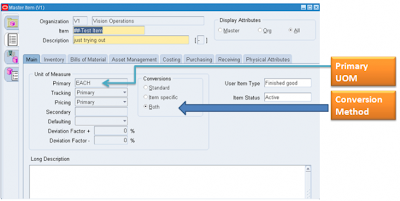 If you create a lot-specific conversion for a lot with on-hand quantities, you can automatically update the quantities in the system to more accurately reflect the on-hand quantity. You can also view the history of changes made to the lot unit of measure conversion, and the corresponding quantity changes. 1. Enter the item number in the Item field. 2. Enter the lot number in the Lot Number field. 3. Select the destination base unit of measure of the class to which you are converting the unit of measure. 4. Enter the conversion factor by which the source base unit is equivalent to the destination base unit. For example, if 16 pounds (source base unit) is equivalent to 1 Gallon (destination base unit), the conversion factor is 16. 5. Optionally, enter an inactive date for the conversion. This is the date when the unit of measure conversion for the lot reverts back to the standard inter-class conversion. 6. 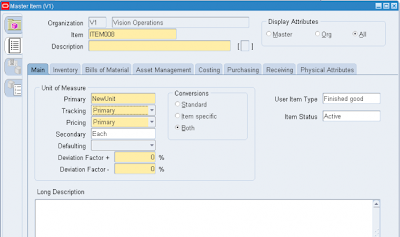 Optionally, enter a transaction reason for the conversion.